Fluorescence-based optical imaging is indispensable to investigating biological systems with high spatial resolution and fast temporal speed. 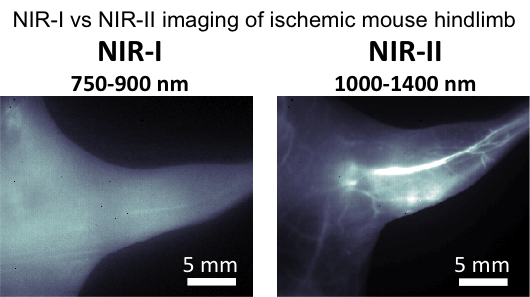 NIR-II optical window imaging can resolve in the sub-5 micron to sub-100 micron range at 3-5 millimeter depth though the intact body and brain of mice. Nirmidas’ NIR-II fluorophores are of high quantum yield and can be functionalized by a variety of targeting moieties for molecular imaging and vessel/organ imaging in vitro and in vivo. Nirmidas researchers have developed a near infra-red II (NIR-II) dye product (IR-E1050) with high quantum yield and high biocompatibility (renal excretion). Functionalizable with a variety of targeting groups for molecular imaging and vessel/organ imaging in vitro and in vivo. Nirmidas NIR Dye is available to purchase today. Email us at sales@nirmidas.com or fill in the form below. We'll reach out to understand your needs and show you how Nirmidas Near Infra-red Dye can support your research.